November 7, 2018 Robert W.
Cheap magnetic signs can get you that car magnetic door sign for a good price. Cheap magnetic signs are great for low budget advertising because you can simply put magnetic door signs on your vehicle and instantaneously they will be seen by all the other vehicles travelling next to you. Small business owners choose magnetic signs because they can turn there ordinary personal vehicle into a business vehicle in a matter of seconds by putting these car magnets on their vehicles. By taking them off, they simply have a personal vehicle again they can drive around. Of course your vehicle cannot be plastic or urethane because the magnets need a metallic base to attach to. They should also be flat up against the surface of your vehicle so that no wind can get between your car body and the magnet to stop any chance of your magnet blowing off your car with the help of the wind. Cheap magnetic signs are best when they are sized at 12″ x 18″ in height and width. In this case, the smaller the magnet the better opportunity there is for the magnet to stick to your automobile. It is like the magnets on your refrigerator, the smaller magnets always stay in place, but the larger and heavier magnets have a tendency to slide down the refrigerator door over time. Cheap magnetic signs are just that, inexpensive. These magnetic signs are a great way to advertise on a vehicle or truck. The cost of a 30 mil magnet with your marketing advertising printed on it cost around $30 for a pair of 2 magnets. Of course, magnets can be made larger and smaller than the size listed above. People requesting a pair of car magnets 18″ x 24″ are common. 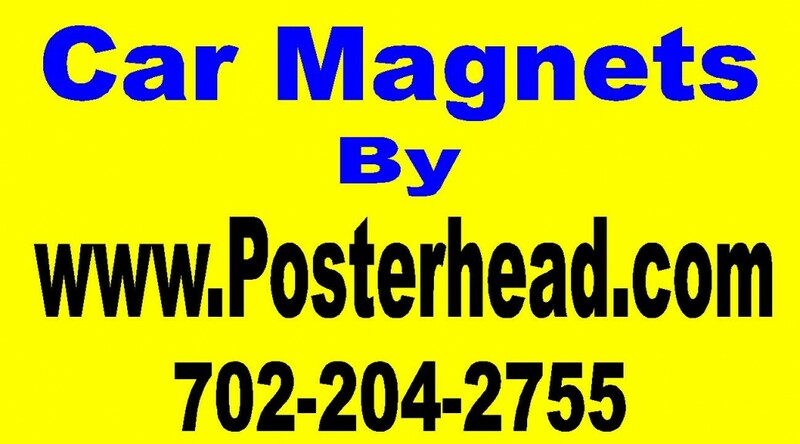 Cheap car magnet signs are available at sign stores in the Las Vegas area. Contact a sign shop today to see how these magnetic signs can help you and your business.